Sam Lane AMRSB looks at some of the technologies and policies that will help cities grow their own food. What if I told you there was a way to meet growing demands for food security, reduce causes of climate change, shrink supply chains and improve public health? Well, some think that urban agriculture might just be the answer, and plant biologists are in a prime position to get involved. Let’s start with food security. London, a city of nearly eight million people, only has food stores for three to four days – if supply was disrupted- which is the worst of any European city according to Tim Lang, professor of food policy at City University, London. Across the country, malnutrition has risen by over 50% since 2010. As more of the world’s population continues on a trend of urbanisation, urban food security is a growing issue, and the impact of poor diets is a growing legacy of ill-health. As for climate change, according to the international research institute CGIAR, food systems contribute 19-29% of global anthropogenic greenhouse gas (GHG) emissions. Concurrently, climate change is impacting both crop production and causing rapid food and cereal-price increases in many regions. There is increasing recognition of the vital role urban farming has to play in food security and health, with city governments beginning to appreciate the social and environmental benefits of urban agriculture. Since October 2015, 133 cities, including London, Mexico City, Quito and Shanghai, have signed up to The Milan Urban Food Policy Pact, committing to feed cities in a more just and sustainable way. 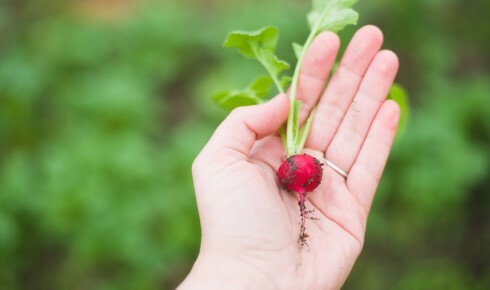 The Pact calls on municipal leaders to acknowledge urban and peri-urban agriculture’s role in contributing to food and nutrition security and human well-being, in addition to protecting biodiversity and ecosystem services. This incredible show of commitment by city mayors is an indication of how food production and consumption are increasingly perceived as critical to protecting our climate, and the health and well-being of urban citizens. What can plant science do? With urban areas growing upwards and outwards, access to rural areas to provide food may be becoming increasingly difficult. While crops are traditionally grown in great swathes of the countryside, new and innovative design in agri-tech could help. There are numerous examples of Urban Agriculture (UA) from across the globe, from extravagant projects such as vertical farming, to smaller-scale community gardens and even ‘guerrilla gardening’ as ways to embed the concept in public minds. Small scale urban farming can provide communities with direct access to fresh fruit and vegetables. However, an understanding of the unique barriers to growing crops in urban environments (where soil, air and water quality can be low) is key. Finding the crops most suitable to remediate these poor environmental conditions could provide additional benefits. With malnutrition highlighted as a problem in cities, plant science can also help to identify crops with suitable nutritional profiles to help alleviate some of these stresses. There are some projects that are already working towards this, such as Capital Growth in London, who have a well-established network of organisations involved in food production. They host events involving workshops and enterprise opportunities with the aim of helping individuals and community projects gain the skills and confidence to become more entrepreneurial and financially self-sustaining. As another example, the C40 Cities initiative has included food systems within their urban planning and development network. More coherent governance is needed to implement urban agriculture effectively. However, with global food security an increasingly pertinent issue, especially given the growing demand for food in urban areas and the pressure on cities to tackle crises in public health and climate change; urban agriculture could be a real solution. Sam Lane AMRSB is an MPA student at UCL’s Department of Science, Technology, Engineering and Public Policy.